The holiday season starts early at A.C.T. ; we began rehearsing our annual production of A Christmas Carol at the beginning of November. 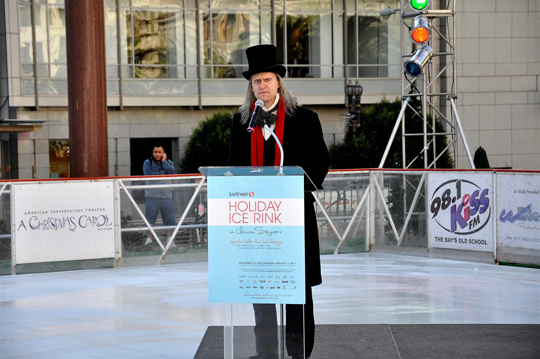 As a sponsor of the Holiday Ice Rink in Union Square, we’re sharing our anticipatory cheer with the city. Below, Scrooge (A.C.T. Associate Artist Anthony Fusco) announces the opening of the rink on Wednesday, November 10. He’s joined by dignitaries, figure skaters, and . . . Mr. Peanut? Third-year A.C.T. Master of Fine Arts Program actor Richard Prioleau is a busy man: he’s in rehearsals for A Christmas Carol and going to class in A.C.T.’s studios each day, while playing the title role in Marcus; or The Secret of Sweet on the mainstage each night. Still, last week he found time to sit down with A.C.T. Dramaturgy Fellow Zachary Moull—who worked as assistant director on Marcus—over lunch (salad and noodles) to talk about the urgency of Marcus, the joys and challenges of acting in Tarell Alvin McCraney’s play, and the musical proclivities of its cast. Your lunch looks very healthy. Do you have any routines or strategies for keeping your energy up? Jared McNeill’s role in Marcus; or The Secret of Sweet may not be huge, but his onstage presence is enormous. As Terrell, the obnoxious-but (in McNeill’s hands)-loveable dude who follows Osha and Shaunta Iyun around in the first act, McNeill has the audience in stitches, especially with his bit about white chicks in horror films. 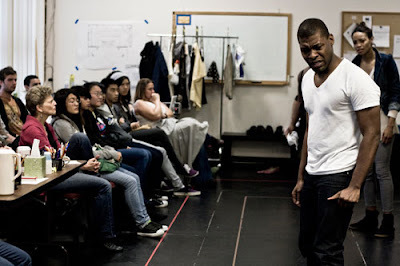 This is not McNeill’s first time charming audiences in a Tarell Alvin McCraney drama. 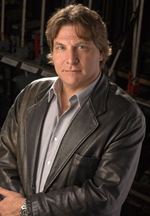 In fact, he has appeared in all three of the Brother/Sister Plays. 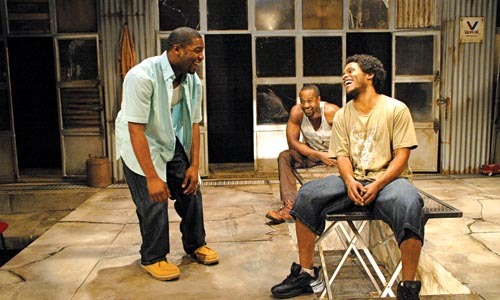 After playing Oshoosi Size in City Theatre’s production of The Brothers Size in Pittsburgh, PA, and Elegba in In the Red and Brown Water at Marin Theatre Company (MTC), McNeill has the unique perspective of having lived and breathed McCraney’s entire cycle. Below, he describes that experience for us. posted by Amelia Nardinelli, Senior Graphic Designer at A.C.T. You may not have seen A.C.T.’s production of Marcus; or The Secret of Sweet yet, but odds are that you’ve noticed a certain mysterious, enigmatic image following you around town. 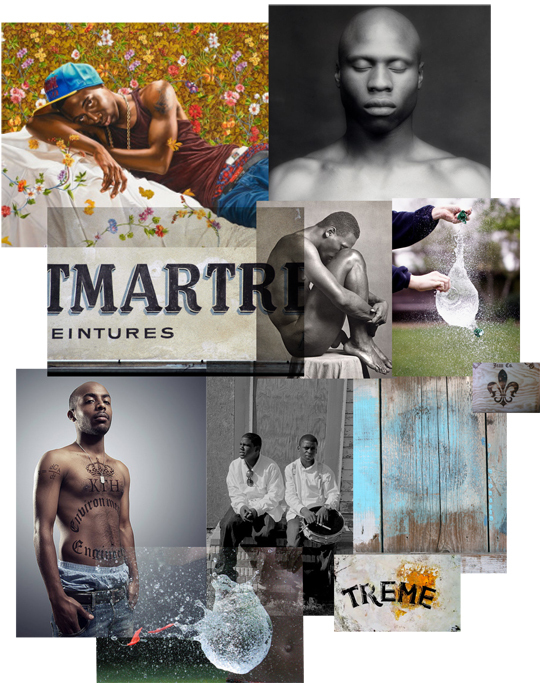 In your newspaper, on BART, or in a shop window, a young black man with an otherworldly glow about him and a heart-shaped explosion of water over his chest stares back at you. His eyes are full of something. Maybe his gaze unsettles you. The man is Richard Prioleau, member of the A.C.T. Master of Fine Arts Program class of 2011 and star of Marcus, and the poster design is by Amelia Nardinelli, senior graphic designer at A.C.T. The poster has such an iconic presence it takes a moment to remember that it was created by a particular person. But created it was, and below Nardinelli lets us into the world of her process. A.C.T. Young Conservatory students are sharp. We’d heard it from everyone: YC Director Craig Slaight; Karen Hartman, author of Wild Kate (a new play commissioned by the A.C.T. M.F.A. Program and YC); the M.F.A. Program students who’ve worked with them on conservatory coproductions and in A Christmas Carol. 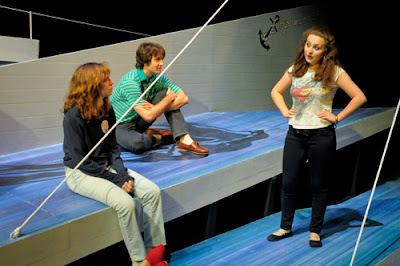 So when we knew they were in the building rehearsing Wild Kate, we didn’t want to miss the chance to let them weigh in on young actor training and the dark hilarity of Wild Kate’s nautical adventures. Naomi Kunstler, a junior at Convent of the Sacred Heart high school, pulls us into the nitty gritty of rehearsal as only a true actor could. A.C.T.’s dramaturgy intern, Zach Moull, one fourth of A.C.T.’s blog quadrumvirate, has been doing double-duty, serving as the assistant director for Marcus; or The Secret of Sweet in addition to his literary duties. He’s been privy to some of the amazing outreach events that a play like Marcus can facilitate, including a recent presentation to at-risk teens. Enjoy his description of the day, and check out the photos by former A.C.T. Marketing Intern Timothy Faust below! A couple of weekends ago, the cast of Marcus; or The Secret of Sweet welcomed an audience into the rehearsal room for the first time since the production's opening rehearsal, when we welcomed a group of LGBT teens to an early read-through of the play. And welcome home! What better way to celebrate Marcus; or The Secret of Sweet day (as today was proclaimed by the Mayor’s office), than a citywide parade! 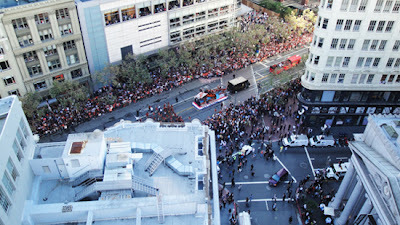 Here are some photos of the festivities from the roof of our administrative offices/school. Unfortunately, it does not quite catch the uproarious hurrahing or the continuous horn blowing, but still . . .
Marcus opens tonight, and we’re all in quite the festive mood!